Posted on February 2, 2014 by Ronald Patrick Raab, C.S.C. 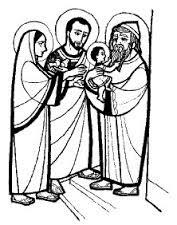 We approach the temple with Mary and Joseph and the Child Jesus. Simeon and Anna await the miracle of Jesus. Their lives, hearts and hopes are set upon the promise of the Messiah. We wait for freedom and new life. These are my hopes about what you would find in the temple. I pray that you find the peace that will release you from fear. I pray that you find the love of God that will give you hope. I pray that the burdens you carry will be laid to rest in Christ. I pray that discouragement will give way to joy. I pray that you will be released from the worries that bind you. I pray that you will find healing in the grief that you carry from your past. I pray that the temple will house your hopes for your relationships. I pray that the temple will give you direction when you feel lost. I pray that the temple will give you silence when you feel overwhelmed. I pray that you find answers that will satisfy your deepest questions. I pray that you discover relationships that will soften your loneliness. I pray that you realize over and over again you are a child of God. Thanks. This is a real gift. I pray that your prayers are answered.